10 Reasons Having a Boy Rocks! - Baby Doodah! 10 Reasons Having a Boy Rocks! My little boy is my world! This is why having a boy rocks! When I was a little girl, I always wanted a daughter. I’d think about how I would dress her, play dolls with her, put on make-up, etc, but then as I got older, I realized how much fun boys are. Girls still are awesome, but boys rock! 1. Rough and tumble play is the norm. I don’t think there’s a single day that passes, where Emmett doesn’t egg me on to chase him and push him to the ground and tickle him. I love this! I love the high pitched giggles that ensue while he’s being chased and then him begging with his sweet “again” “again,” every single time! 2. His toys are pretty awesome! I’ve definitely always been a doll person, but I’m realizing that there is nothing cooler than pushing a car down the track and hearing the mechanical roar of the engine, or seeing who can build the biggest spaceship with his legos. Seriously, so much fun! 3. The love we have for one another is very different than mother/daughter love. I can’t explain it, but the love I have for my own mom is very different than what I feel between Emmett and myself. Now, I do realize that’s partially because he’s my child, but boys need their moms in different ways and it’s really exciting to get to know this new aspect of love. 4. Realizing that there is a whole new realm of things associated with having a boy. Man, as I read more and more about what boys go through as they grow, develop and change, I realize how easy it was (at times) to be a girl. Being a girl definitely has it’s own set of pressures, but believe it or not, being a boy is hard work. Boys are mischievous and energetic! They need to move, and can’t just be still (unless you put in a good episode of Daniel Tiger). LOL That’s not something I’m used to. I remember loving to read and enjoying peace and quiet, as I was growing up. Emmett is the total opposite, he wants to move ALWAYS! 5. No need to do their hair. Sure, I comb Emmett’s hair every morning and after his bath, but I don’t spend any time making pony tails, or putting in bows. Not only does it save the time of needing to fix hair, but also the frustration of getting your toddler to sit still long enough to get their hair done. And, OH MAN! If there are knots (my mom used to call them snarls, anyone else? ), the kid will be crying for mercy! Getting my hair done in the morning was the pits, until I did it myself. 6. Dresses are cute, but a well dressed little boy will knock your socks off! I won’t lie, there have been a few moment when I’ve wandered over to the girly side of Carter’s and wished I had a little girl to put in one of those adorable dresses, but then I put my son in a button down shirt, tie, and sweater vest and WOOO-WEE!! I’m in awe of his handsome-ness! There’s just something about a well dressed man. 7. I love dress shoes, but in order to keep up with Emmett it’s flats, preferably sneakers ALL THE TIME! As I mentioned earlier, Emmett’s a busy busy boy, it is absolutely necessary to own several pairs of good flats. When we’re out in the backyard playing, I opt for sneakers, they keep me quick on my feet and ready to move about. If we’re shopping, I’ll wear a cute pair of flats, or in the summer, flip flops. Heels and dress shoes don’t really have a place in my wardrobe, except for in the office. 8. Little boys love their mommies like nothing else. There’s no doubt that Emmett loves his dad, but (not to brag) he’s totally hooked on me. I’m the one he comes to for comfort, to cuddle or to kiss it better and I wouldn’t trade that for ANYTHING. There’s just something very special about the bond that Emmett and I have. 9. I don’t stress about whether Emmett is chubby or not. Granted, any child at the age of 2 should not be worried about what they’re eating, so long as it a mostly balanced diet, but as he gets older, he is less likely to have body image issues than a little girl. I’ve dealt with weight issues and self-esteem issues since I can remember, I’d love for my child to never have to suffer through that and just enjoy every minute of his beautiful life. 10. Watching him slowly grow into a sweet, gentle and loving boy warms my heart. Seamus and I do our very best to ensure that Emmett gets a plethora of hugs, kisses and cuddles whenever he needs them. Our hope is that he turns into the a kind gentleman to whoever comes into his life as he gets older. What are YOUR favorite things about having a boy? 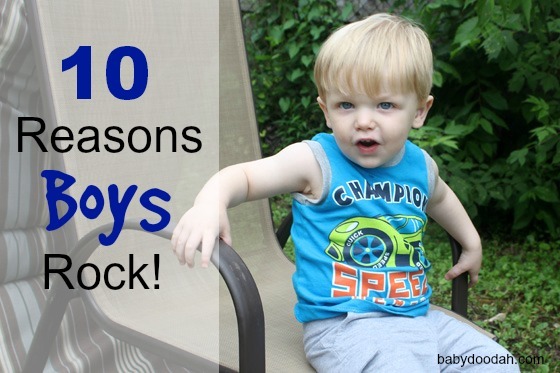 6 Responses to 10 Reasons Having a Boy Rocks! Sweet list – I just had a baby boy 2 weeks ago so I have lots to look forward to!! Hi Jess!! Boys are so rad! I am positive you will love all the fun they bring as he gets older! Hi Tiffany! They sure do keep us on our toes. Thank you for visiting. sticks, stick, and more sticks that eventually turn into swords and mines only two! I enjoy the sweet moments the most!